Elvis Presley was the hottest act in all of show business by the summer of 1956. The 21-year-old singing dynamo had electrified the entire world in his live shows, concerts and television appearances. His records and albums were selling like proverbial hotcakes. But in spite of all his incredible success, Elvis wanted more; he wanted to be a movie star. As a teenager, Elvis had been an usher in a movie theater where he studied his silver screen idols, such as Marlon Brando and Montgomery Clift. Later, as Elvis’ star was rising, so was his new movie star idol’s- James Dean. Elvis watched Dean’s iconic performance in 1955’s Rebel Without a Cause dozens of times. It was reputedly his favorite film of all time. Unsurprisingly, one of Elvis’s fervent hopes at this early point in his career was to become the next James Dean. Elvis’s first day on the set was August 20, 1956. The film, originally titled The Reno Brothers, was a Western, set in the immediate aftermath of the Civil War. Elvis’ co-stars were veteran actors Richard Egan, Robert Middleton, William Campbell and Mildred Dunnock. 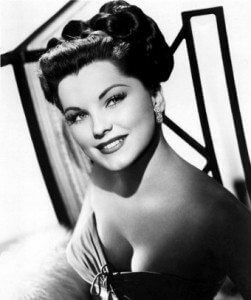 His leading lady was the stunning 23 year old Debra Paget, who Elvis had a huge crush on, reportedly flirting with Paget almost from day one and following her around the set like a lovesick puppy. According to an interview with Paget in 1997, she claimed Elvis even proposed to her. Unfortunately for the future king, the young starlet was, as she put it, “in love with Howard [Hughes]” at the time. It was also reported that Paget was intimately involved with Hughes, but she claimed in an interview in 1956 that in the two years she spent time with Hughes, she was always accompanied by her mother whenever visiting him. She also stated that her relationship with Hughes never went very far because she needed a “one-woman man”. Hughes didn’t exactly fit the bill. Nevertheless, involved in her own little crush, she kept Elvis at arm’s length. Elvis’ role (as youngest Reno brother Clint) was soon expanded from one that had just a few lines, to many. Also, with superstar Presley coming aboard, the movie’s title was changed from The Reno Brothers to Love Me Tender, in a little marketing move to both promote the song, which hit the airwaves on November 3, 1956 shortly before the film made its debut, and the movie simultaneously. A few other songs were also added to the film. Elvis wasn’t too happy with this as he originally believed he would just be given a straight acting role. (This would be a pattern for the rest of Elvis’ movie career, with him wanting to do serious acting and the studios wanting to cram in as many new Presley songs as possible in every film.) On top of his displeasure over this, Elvis got cold feet when he saw that his character died in the end. His then girlfriend, June Juanico, later claimed she persuaded him to stay in the movie by saying that she tended to remember the characters in movies who had a tragic fate far longer than those who lived happily ever after. The film was shot over the next few weeks, but in the original ending, Ma Reno rings the dinner bell and the three remaining Reno brothers come in for dinner. (Elvis had been shot and killed in a previous scene.) However, at an early screening, the Elvis fans hated seeing their idol die and a new ending was cooked up. Now at the film’s conclusion as the end credits roll, Elvis’s ghostly presence appears and sings the title song. With that, Love Me Tender wrapped in October of 1956 and was rush-released by November 15th. It proved to be a relative hit, debuting about a week before, ironically enough, James Dean’s final film Giant. (Dean died a little over a year before this in September of 1955.) 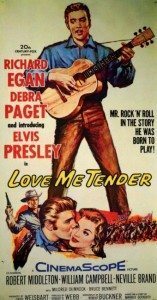 In total, Love Me Tender grossed an estimated $9 million (about $78 million today) off a budget of just over $1 million. Despite its very late release in the year and somewhat lukewarm reviews by critics, it also managed to ring in as the 23rd top grossing film of 1956. Elvis had signed on to Love Me Tender with high hopes for a great career in films. But in the end, it was (with precious few exceptions) to be only the first of a long chain of big-screen disappointments, largely comprised of campy grade-B objects of satire and ridicule. And (in a painful irony) although he grew to loathe the films and they were savaged by the critics, the Elvis musicals of the 1960s inevitably cleaned up at the box office. And so it was that the vastly talented and influential musical superstar was, in the pursuit of his other dream, for almost a full decade relegated to playing the good-natured, guitar-playing “hero” who would inevitable beat up the bad guy and dance around with a bevy of bikini-clad lovelies. Not exactly “the next James Dean” that he had hoped for.